For other people named Joe Clark, see Joseph Clark. Charles Joseph "Joe" Clark, PC CC AOE (born June 5, 1939) is a Canadian elder statesman, businessman, writer, and politician who served as the 16th prime minister of Canada, from June 4, 1979, to March 3, 1980. The Alberta Order of Excellence is a civilian honour for merit in the Canadian province of Alberta. Instituted in 1979 when Lieutenant Governor Frank C. Lynch-Staunton granted Royal Assent to the Alberta Order of Excellence Act, the order is administered by the Governor-in-Council and is intended to honour current or former Alberta residents for conspicuous achievements in any field, being thus described as the highest honour amongst all others conferred by the Canadian Crown in right of Alberta. Despite his relative inexperience, Clark rose quickly in federal politics, entering the House of Commons in the 1972 election and winning the leadership of the Progressive Conservative Party in 1976. He came to power in the 1979 election, defeating the Liberal government of Pierre Trudeau and ending sixteen years of continuous Liberal rule. Taking office the day before his 40th birthday, Clark is the youngest person to become Prime Minister. His tenure was brief as he only won a minority government, and it was defeated on a motion of non-confidence. Clark's Progressive Conservative Party lost the 1980 election and Clark lost the leadership of the party in 1983. Joseph Philippe Pierre Yves Elliott Trudeau, often referred to by the initials PET, was a Canadian statesman who served as the 15th prime minister of Canada. He was the third longest-serving prime minister in Canadian history, having served for 15 years, 164 days. A motion of no-confidence, alternatively vote of no confidence, or (unsuccessful) confidence motion, is a statement or vote which states that a person in a position of responsibility is no longer deemed fit to hold that position, perhaps because they are inadequate in some respect, are failing to carry out obligations, or are making decisions that other members feel detrimental. As a parliamentary motion, it demonstrates to the head of state that the elected parliament no longer has confidence in the appointed government. If a no confidence motion is passed against an individual minister they have to give their resignation along with the entire council of ministers. He returned to prominence in 1984 as a senior cabinet minister in Brian Mulroney's cabinet, retiring from politics after not standing for re-election for the House of Commons in 1993. He made a political comeback in 1998 to lead the Progressive Conservatives in their last stand before the party's eventual dissolution, serving his final term in Parliament from 2000 to 2004. Clark today serves as a university professor and as president of his own consulting firm. Martin Brian Mulroney is a Canadian politician who served as the 18th prime minister of Canada from September 17, 1984, to June 25, 1993. His tenure as prime minister was marked by the introduction of major economic reforms, such as the Canada-U.S. Free Trade Agreement and the Goods and Services Tax, and the rejection of constitutional reforms such as the Meech Lake Accord and the Charlottetown Accord. Prior to his political career, he was a prominent lawyer and businessman in Montreal. The Progressive Conservative Party of Canada (PC) was a federal political party in Canada. Clark attended local schools and the University of Alberta, where he earned bachelor's and master's degrees in political science. [ citation needed ] While in high school, he gained journalism experience with the High River Times and the Calgary Albertan. In his first year at the University of Alberta, Clark joined the staff of the campus newspaper Gateway and eventually became editor-in-chief. Clark was also a member of the University of Alberta Debate Society (UADS). He later worked one summer at the Edmonton Journal where he met his future biographer, David L. Humphreys. He also worked one summer with The Canadian Press in Toronto, and for a time seriously considered a career in journalism. The University of Alberta is a public research university located in Edmonton, Alberta, Canada. It was founded in 1908 by Alexander Cameron Rutherford, the first premier of Alberta, and Henry Marshall Tory, its first president. Its enabling legislation is the Post-secondary Learning Act. The university is considered a “Comprehensive academic and research university” (CARU), which means that it offers a range of academic and professional programs, which generally lead to undergraduate and graduate level credentials, and have a strong research focus. Political science is a social science which deals with systems of governance, and the analysis of political activities, political thoughts, and political behavior. It deals extensively with the theory and practice of politics which is commonly thought of as determining of the distribution of power and resources. Political scientists "see themselves engaged in revealing the relationships underlying political events and conditions, and from these revelations they attempt to construct general principles about the way the world of politics works." Clark then attended Dalhousie Law School. However, he spent more time with the Dalhousie Student Union, Progressive Conservative politics and the Dalhousie Gazette , than on his courses. After leaving Dalhousie, he unsuccessfully pursued first-year law studies at the University of British Columbia Faculty of Law in Vancouver. Clark again became active in student politics, serving as president of the Progressive Conservative Youth wing for two terms. He then worked full-time for the Progressive Conservative Party. The Schulich School of Law is the law school of Dalhousie University in Halifax, Nova Scotia, Canada. 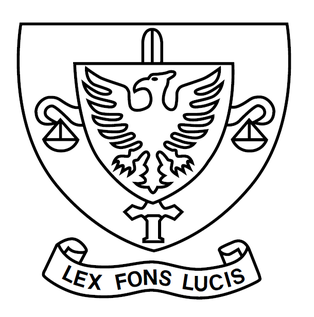 Founded in 1883 as Dalhousie Law School, it is the oldest university-based common law school in Canada. It adopted its current name in October 2009 after receiving a $20-million endowment from Canadian businessman and philanthropist Seymour Schulich. The Dalhousie Student Union (DSU) is the official representative of students at Dalhousie University in Halifax, Nova Scotia. The Dalhousie Gazette is the main student publication at Dalhousie University in Halifax, Nova Scotia, Canada. The paper first began publishing in 1868, making it the oldest continually operating student newspaper in North America followed by The Harvard Crimson (1873) and The Columbia Daily Spectator (1877).. The founding editors were J.J. Cameron, A.P.Seeton, and W.E. Roscoe. In 1973, Clark married law student Maureen McTeer. They met when Clark hired her to work in his parliamentary office; McTeer had been a political organizer herself since her early teens. McTeer has developed her own career as a well-known author and lawyer, and caused something of a fuss by keeping her maiden name after marriage. That feminist practice was not common at the time, but was later taken up by other political wives, such as Hillary Clinton. [ citation needed ] Their daughter, Catherine has pursued a career in public relations and broadcasting. He entered politics at age 28 but was unsuccessful as candidate for the provincial Progressive Conservatives in the 1967 provincial election. 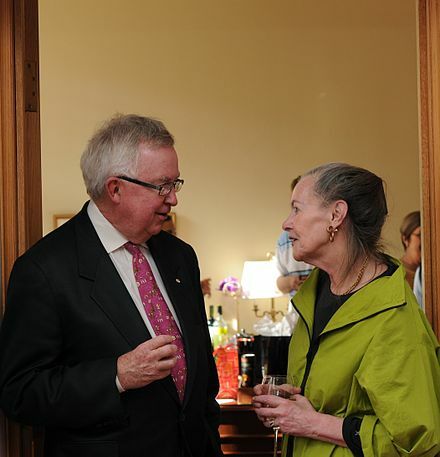 Clark served as a chief assistant to provincial opposition leader and future Premier Peter Lougheed, and served in the office of federal opposition leader Robert Stanfield, learning the inner workings of government. Clark missed being elected to the Legislative Assembly of Alberta in the 1971 provincial election. However, he ran in the federal election held a year later, and was elected to Parliament as the MP for Rocky Mountain, a largely rural riding in southwestern Alberta. 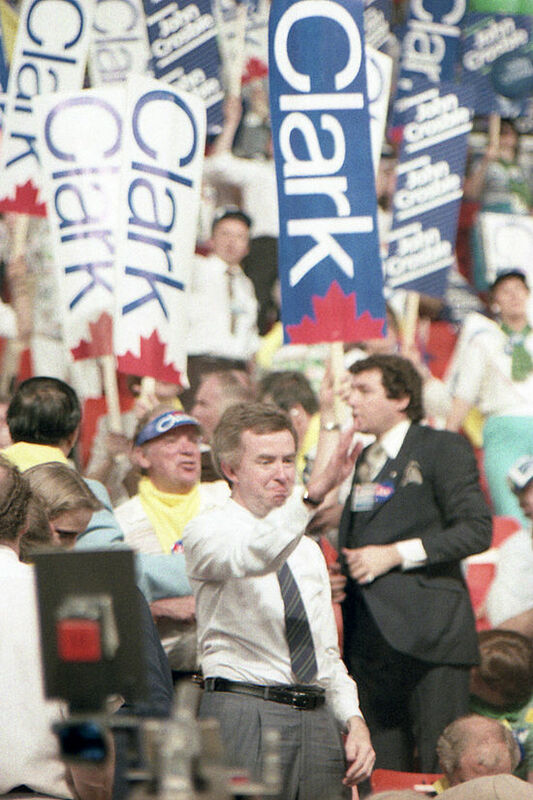 Joe Clark's rapid rise from a relatively unknown Alberta MP to the Leader of the Opposition took much of Canada by surprise. The Toronto Star announced Clark's victory with a headline that read "Joe Who? ", giving Clark a nickname that stuck for years. Much joking was made of Clark's clumsiness and awkward mannerisms. Skinny and tall, he became a frequent target for editorial cartoonists, who delighted in portraying him as a sort of walking candy apple, with an enormous head and floppy dog-like ears; cartoonist Andy Donato typically drew Clark with mittens on strings hanging from his suit sleeves. Initially, it seemed unlikely that a man who was the source of so much mockery could ever hope to compete against the confident and intellectual Pierre Trudeau. It also did not help that the Progressive Conservatives lost a string of by-elections on May 24, 1977. Large budget deficits, high inflation, and high unemployment made the Liberal government unpopular. Trudeau had put off asking the Canadian Governor General to call an election as long as possible, in the hope that his party could recover popular support but it backfired, as there was growing public antipathy towards his perceived arrogance. Clark campaigned on the slogans, "Let's get Canada working again", and "It's time for a change—give the future a chance!" In the latter half of the campaign, the Liberals focused their attacks on Clark's perceived inexperience. Their advertisements declared "This is no time for on-the-job training", and "We need tough leadership to keep Canada growing. A leader must be a leader." Clark played into their hands by appearing bumbling and unsure in public. When Clark undertook a tour of the Middle East in order to show his ability to handle foreign affairs issues, his luggage was lost, and Clark appeared to be uncomfortable with the issues being discussed. That incident was widely lampooned by Toronto Sun cartoonist Andy Donato. During the same tour, while inspecting a military honour guard, Clark turned too soon and nearly bumped into a soldier's bayonet; one of the first major media reports on the incident claimed, with some exaggeration, that he had nearly been beheaded. Despite Clark being bilingual, the Tories were unable to make much headway in Quebec, which continued to be federally dominated by the Liberals. While Clark's 1976 leadership rivals were prominent in that province, Claude Wagner had left politics (he died shortly after the election), while Brian Mulroney was still bitter about his loss and turned down an offer to serve under Clark. Nonetheless, Clark's Progressive Conservatives won 136 seats to end sixteen continuous years of Liberal rule. The Progressive Conservatives won the popular vote in seven provinces. They also made huge gains in Ontario, particularly in the Toronto suburbs. However, they were only able to win two seats in Quebec, leaving them six seats short of a majority. The Liberals lost 27 seats, including several high-profile cabinet ministers, and Trudeau announced his intention to step down as party leader. On June 4, 1979, the day before his 40th birthday, Clark was sworn in as Canada's youngest prime minister, steering the first Tory government since the defeat of John Diefenbaker in the 1963 election. Social Credit was below the 12 seats needed for official party status in the House of Commons. However, the six seats would have been just enough to give Clark's government a majority had the Progressive Conservatives formed a coalition government with Social Credit, or had the two parties otherwise agreed to work together. Clark managed to lure Socred MP Richard Janelle to the government caucus, but this still left the Tories five seats short of a majority. Clark however decided that he would govern as if he had a majority,  and refused to grant the small Socred official party status, form a coalition, or co-operate with the party in any way. Though the election had been held in May, Parliament did not resume sitting until October, one of the longest break periods in Confederation. The gas tax in the budget soured Clark's relationship with Ontario Premier Bill Davis, even though both were Red Tories. Even before the budget, the government was criticized for its perceived inexperience, such as in its handling of its campaign commitment to move Canada's embassy in Israel from Tel Aviv to Jerusalem. Internationally, Clark represented Canada in June 1979 at the 5th G7 summit in Tokyo. Compared to his predecessor as Prime Minister, Clark reportedly had a better relationship with US President Jimmy Carter, who phoned Clark to wish him luck in the upcoming 1980 election. During the 1979 election campaign, Clark had promised to cut taxes to stimulate the economy. However, once in office, he proposed a budget designed to curb inflation by slowing economic activity, and also proposed a 4 cent per litre (18 cent per gallon) tax on gasoline in order to reduce the budgetary deficit. Finance Minister John Crosbie touted the budget as "short term pain for long term gain". Though Clark had hoped this change in policy would work to his advantage, it actually earned him widespread animosity as a politician who could not keep his promises, even in such a short period. The no-confidence vote loss was partially welcomed by Clark and the Tories. When a new election was called, Clark expected his party would be able to defeat the demoralized and leaderless Liberals easily, since Trudeau had announced his intention to step aside and the Liberals had yet to hold a leadership convention. However, the Progressive Conservatives had misjudged the electorate, since they had not commissioned any polls since August. A November Gallup poll published eight days before the December 11 budget reported that their popularity was down from 36% during the summer to 28%, with the party 19 points behind the Liberals, giving the latter the popular support to initiate the non-confidence motion. 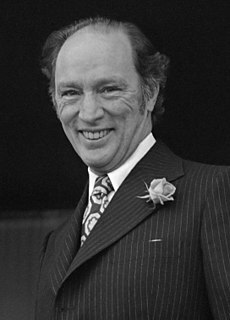 After the government fell, Clark's party was caught off guard when Pierre Trudeau quickly rescinded his resignation from the Liberal leadership to lead his party into the subsequent election. Clark's Tories campaigned under the slogan, "Real change deserves a fair chance", but the broken promises were still fresh in voters' minds. Trudeau swept the Liberals back into power in the February 1980 election with 147 seats, against 103 for the Progressive Conservatives. Davis' criticism of the gas tax was used in the Liberals' Ontario television ads. The Tories lost 19 seats in that province, which ultimately proved to be decisive in the campaign. Clark's government would last a total of nine months less a day. As Clark's Finance Minister, John Crosbie, famously described it in his own inimitable way: "Long enough to conceive, just not long enough to deliver." Trudeau commented in his memoirs, published in 1993, that Clark was much more tough and aggressive than past Tory leader Robert Stanfield, noting that those qualities served Clark well in his party winning the 1979 election victory. However, Trudeau also complimented Clark as a respectable leader and a better choice over Brian Mulroney, who had defeated Clark at the leadership convention in 1983. Trudeau told his friends that the Tories had chosen the wrong man. When Mulroney took over the reins of the Progressive Conservatives, Trudeau's Liberals attacked them with the slogan "Bring back Joe! ", taking aim at how the Tories had replaced their proven leader with an unknown. In contrast to Clark, Trudeau and Mulroney had become bitter enemies over the Meech Lake Accord, despite never having fought an election. At Trudeau's funeral in 2000, his son, future Prime Minister Justin Trudeau related a story in which he had told a joke about one of his father's chief rivals, and his father had corrected him, lectured him sternly on how it was wrong to insult someone just because they disagreed, and then introduced him to the rival. At this point in the ceremony, the CBC cut to an image of a teary-eyed Clark, in attendance at the funeral. There is reason to believe this reference (along with the mention that the rival had a "pretty blonde" daughter, a description that can be applied to Catherine) had been to Clark. Opposition to Clark's leadership began to grow after the fall of the PC minority government, and the party's defeat by a resurgent Liberal Party. There were frequent rumors that several potential challengers were covertly undermining Clark's leadership; though in 1982 Brian Mulroney appeared at a press conference with Clark to say that he was not seeking the leadership of the PC party. The Liberal Party had regained national prominence by leading the "No" side to victory in the 1980 Quebec referendum and the Constitution patriation. While Trudeau's National Energy Program was hugely unpopular in Western Canada, especially Alberta, it was able to shore up Liberal support in the voter-rich Eastern Canada, particularly Ontario and Quebec, generally having the opposite effect of Clark's proposed gas tax. Difficult budgets and the economic recession resulted in Trudeau's approval ratings declining after the bounce from the 1982 Constitution patriation and showed his party headed for certain defeat by early 1984, prompting him to retire. However, Clark was unable to stay on as Progressive Conservative leader long enough to regain the Prime Ministership. At the party's 1981 convention, 33.5% of the delegates supported a leadership review; they felt that Clark would not be able to lead the party to victory again. At the January 1983 convention in Winnipeg, 33.1% supported a review. The fact that Clark had been able to increase his support among party members by only 0.4% was likely a contributing factor to his decision to resign as leader and seek a renewed mandate from the membership through a leadership convention. This was also considering that the governing Liberals under Pierre Trudeau were slipping in polls, and although the PCs had built up a substantial lead in popularity, Trudeau was expected to retire before the election and a new Liberal leader could have been able to pull off a victory. Joe Clark on the floor of the 1983 leadership convention. Clark immediately nominated to keep his leader's post, and retained support from most of the Red Tories and other party members who were opposed to the public attacks on his leadership by others in the party. Clark already had most of a campaign team up and running by the time he called the leadership convention, as he had mobilized support to help gain in the convention's leadership review. However, Mulroney and John Crosbie had been laying the groundwork for a campaign for some time, with Crosbie expecting Clark to lose or resign soon, and Mulroney supportive of the anti-Clark movement. In a rematch of the 1976 convention, Mulroney emerged as the main challenger, gaining the support of the party's right wing, which viewed Clark as too progressive and opposed his continued leadership. Other party members felt that the federal Liberal Party's stranglehold on Quebec seats (they held all but one of the province's 75 seats) could only be broken by a native from that province, which gave Mulroney considerable support. Media coverage emphasized the pro-business and neo-liberal bent of most of the candidates as a "Changing of the Guard" within the PC party from their more classical conservative and moderate elements. Clark's campaign countered this by trying to polarize the election between right wingers and a centrist who had been able to win before. The Mulroney campaign responded by continuing their pro-business line. Several candidates agreed to an "ABC" (Anybody But Clark) strategy for the convention and when news of that back-room deal broke out, support was expected to rally around the party's embattled leader. During delegate voting, Clark won the first ballot, but only won 36.5% of the vote, well short of the 50% required. His support dwindled over the next two ballots. Mulroney, who was endorsed by all but two candidates, defeated Clark on the fourth ballot. Clark urged his supporters to leave the convention united behind Mulroney, and agreed to serve under him. Many political observers and analysts have questioned Clark's rationale for the decision. One famous incident involved a 1987 official dinner held for Prince Charles at Rideau Hall. When the Prince met Clark in the receiving line at the function, he asked to Clark: "why wasn't two thirds enough?" Clark's wife, Maureen McTeer, elaborated on Clark's decision in her 2003 autobiography, In My Own Name. McTeer suggested that for her husband, anything less than a 75% endorsement would not have been a clear enough mandate to forge onwards from the party membership. Clark feared that the 34% of PC members who did not support him would become his most vocal critics in the upcoming election campaign, and that his continued leadership would have led to fractures in the party. Clark was convinced that he could win another leadership race and gain a clear level of support, once his qualities were compared against the handful of politically inexperienced challengers who coveted his position and who were covertly undermining his leadership. The Progressive Conservatives, led by Mulroney, went on to win a huge victory in the 1984 election, and Mulroney became prime minister. Despite their personal differences, Clark ably served in Mulroney's cabinet as the Secretary of State for External Affairs, as the Minister of Foreign Affairs was known before 1993. Along with Arthur Meighen, Clark is one of two former Prime Ministers who have returned to prominent roles in Parliament. managing nonetheless to maintain extremely strong ties with the US, helping steer the North American Free Trade Agreement negotiations to a final agreement. During his term as External Affairs minister, Clark championed Canada's unabashed disapproval of the apartheid regime in South Africa. Canada was the only G7 nation to take such a resolute stance against the apartheid regime during the 1980s. He also took on the difficult Constitution ministerial portfolio after the failure of the Meech Lake Accord, and vigorously pursued his task. He maintained Canada's independent voice politically and socially at a time of increasing economic integration with the US and the rise of more socially conservative right-wing politics there. Clark later served as the President of the Queen's Privy Council for Canada. With Quebec's constitutional status within Canada a rising issue, he shifted to become the Minister responsible for Constitutional Affairs. The latter position saw him play a leading role in the drafting of the Charlottetown Accord, which was decisively rejected in a nationwide referendum and further hurt the standing of the PC party in polls. He retired from politics in 1993, side-stepping the near annihilation of the PC party in the 1993 election under the leadership of Mulroney's successor Kim Campbell. Clark was appointed as Special Representative to the Secretary-General of the United Nations for Cyprus from 1993–1996. In 1993, he founded his own consulting firm, Joe Clark and Associates, Ltd., which he still heads. Clark has also served on the boards of directors or advisory boards of several Canadian companies. In 1994, he was made a Companion of the Order of Canada. Also in 1994, he wrote the book A Nation Too Good to Lose: Renewing the Purpose of Canada. This book was also published in a French translation. The 1995 Quebec referendum saw the federal side win by less than one percent of the vote. It was widely seen as being the failure of the Charlottetown and prior Meech Lake accords that had caused it to be so close. Although Clark and Mulroney had long been perceived as bitter opponents, Mulroney's speech at the 2003 PC leadership convention praised Clark as an honest and admirable leader who had the distinction of being the only prime minister in recent memory who, even when he failed, was always respected, and never hated, by the Canadian public. At the time of his retirement, polls showed that he was in fact the single most trusted political personality in Canada. However, the publication of The Secret Mulroney Tapes shows that Mulroney continued to hold negative feelings towards Clark during the 1980s and 1990s. It took two years for Clark to return to Parliament. He was elected for Kings—Hants, Nova Scotia, in a by-election on September 11, 2000, after the incumbent MP, Scott Brison, stood down in his favour. This is common practice when a newly elected party leader does not already have a seat in Parliament. For the general election held two months later, Clark yielded Kings-Hants back to Brison and was elected as the MP for Calgary Centre, by then deep in the heart of Canadian Alliance territory. Clark ran on his previous experience as Prime Minister and External Affairs Minister. However, he faced a difficult task, with critics and opponents attacking him and the PC Party as a "vote for the past". Jean Chrétien's governing Liberals were running on their successful economic record, and they were poised to regain the support that they lost in 1997, threatening the PC's 1997 gains in Ontario, Quebec, and the Atlantic provinces. The PC party lost ground in Quebec (due in part to the departure of Jean Charest to provincial politics), which resulted in three members of the PC caucus defecting to join the Liberal Party prior to the election. However, Clark was judged by audiences to be the best speaker during the 2000 election debates. The party lost seats to the Liberals, though it managed to hang onto the minimum 12 seats necessary to be recognized in the House of Commons as an official party and therefore qualify for research funding, committee memberships, and minimum speaking privileges. Aside from Clark's Calgary seat (one of only three Alberta seats that did not go to the Canadian Alliance), and one each in Manitoba and Quebec, the party's seats were concentrated in Tory bastions in the Atlantic provinces. Clark continually promoted the idea that the PCs would eventually retake Ontario and form a federal government again. His vision for the party was one that was to the left of the Alliance, but to the right of the Liberals. He soon realized that there was no chance of dislodging the Liberals as long as the centre-right remained split. However, he wanted a merger on his terms. He got his chance in 2001, when several dissident Alliance MPs, the most prominent one being Alliance deputy leader and party matriarch Deborah Grey, left the Alliance caucus. The dissidents felt that Alliance leader Stockwell Day had not learned from mistakes made in the last election. While some of them rejoined the Alliance later, seven of them, led by Chuck Strahl of British Columbia and including Grey, refused and formed the Democratic Representative Caucus. The DRC quickly entered a coalition with the Progressive Conservatives. Clark served as leader of the joint PC-DRC caucus. This lasted until 2002, when Stephen Harper ousted Day as Alliance leader. Harper wanted a closer union with the PCs, but Clark turned the offer down in April 2002, and all but two of the DRC members rejoined the Alliance. One of the two, Inky Mark, eventually joined the PCs. Two by-election victories later in 2002 increased the PC caucus to 15 members and fourth place in the Commons. Clark was selected by the media and many parliamentarians for three years in a row to be Canada's most effective opposition leader between 2000 and 2002, pursuing the Liberal government on issues such as Shawinigate and the Groupaction scandal. In his final mandate, Jean Chrétien repeatedly referred to Clark as the Leader of the Opposition (Clark was not), much to the chagrin of the Canadian Alliance politicians who occupied the Opposition Leader's chair during the same period. Indeed, Chrétien and Clark had been fellow parliamentarians since the 1970s and they shared a mutual respect despite sitting on opposite benches. Clark's personal popularity grew as, once again, scandal enveloped Chrétien's Liberal government. Clark was widely trusted by Canadians, but this, in his own words, did not translate into more votes and additional seats. Citing this, Clark announced his intention to step down as PC leader on August 6, 2002, at the PC Party's Edmonton policy convention. It was expected that a pro-Alliance merger candidate would succeed Clark, but Clark was instead replaced by Peter MacKay on May 31, 2003. MacKay had signed a controversial deal with Red Tory rival David Orchard, promising not to merge the PC Party with the Alliance. Clark had always encouraged MacKay to keep Orchard and his followers within the PC camp. MacKay immediately reversed his position on seeking a merger, and in 2003, 90% of PC Party delegates voted in favor of a merger with the Canadian Alliance. Orchard unsuccessfully tried to block the merger and later joined the Liberal Party. Overall, Clark's efforts to rebuild the PC party had mixed results. In May 2003, the party finally overtook the New Democratic Party as the fourth-largest party in the House of Commons, after by-election wins in Newfoundland and Labrador and Ontario. Many of his supporters have suggested his actions helped sustain the relevance of the weakened Progressive Conservative Party during some of its toughest years when its national alternative status was seriously challenged by the prairie populism of Preston Manning and the Reform Party of Canada and the social conservatism of Stockwell Day and the Canadian Alliance. At the same time, the party was still $10 million in debt from the 2000 election. The PC Party's membership had also dropped from 100,000 in 1998 to 45,000 card carrying PCs in May 2003. Clark's leadership of the Progressive Conservatives was also the subject of criticism from many United Alternative supporters, who argued that his staunch opposition to a merger with the Reform/Alliance parties helped divide the "conservative" vote during the tenure of Jean Chrétien. Some critics accused Clark of being more interested in helping the interests of his own party and own career than the Canadian conservative movement in general. Others attacked Clark's goal of the PC party regaining its former power as unrealistic. On December 8, 2003, the day that the PC Party and the Canadian Alliance were dissolved and the new Conservative Party of Canada registered, Clark was one of three MPs—the other two were André Bachand and John Herron—to announce that they would not join the new caucus. MP Scott Brison had already joined the Liberals. Clark announced that he would continue to sit for the remainder of the session as a "Progressive Conservative" MP, and retired from Parliament at the end of the session. Later, Clark openly criticized the new Conservative Party in the run-up to the 2004 election. He gave a tepid endorsement to the Liberal Party in the 2004 election, calling Paul Martin "the devil we know". He criticized the new Conservative Party as an "Alliance take-over", and speculated that eastern Canada would not accept the new party or its more socially conservative policies against gay marriage and abortion. Clark endorsed former NDP leader Ed Broadbent and other Liberals and Conservatives as individuals, saying that the most important thing was to have "the strongest possible House of Commons of Canada" since neither large party offered much hope. Clark was criticized by some for dismissing the new Conservative Party outright rather than helping to steer it towards a moderate path. Clark continues to apply his experience in foreign affairs. Clark served as Public Policy Scholar at the Woodrow Wilson International Center for Scholars. He served as Distinguished Statesman in Residence, School of International Service, and Senior Fellow, Center for North American Studies, both at the American University, Washington, D.C. In addition to teaching classes at the American University in Washington, Clark has written several op-ed pieces for several of Canada's national newspapers since his retirement. In October 2006, Clark took a position at McGill University as a Professor of Practice for Public-Private Sector Partnerships at the McGill Institute for the Study of International Development. He serves with the Jimmy Carter Center, routinely travelling overseas as part of the centre's international observing activities. Clark sat on the International Advisory Board of Governors of the Centre for International Governance Innovation,  before 2012. As a former prime minister, Clark is entitled to carry "The Right Honourable" designation for life. Clark was made a Companion of the Order of Canada. He is a member of the Alberta Order of Excellence. He was honoured as Commandeur de l'Ordre de la Pleiade from La Francophonie. He also holds the Queen Elizabeth II Silver Jubilee Medal (1977), 125th Anniversary of the Confederation of Canada Medal (1992), Queen Elizabeth II Golden Jubilee Medal (2002), Queen Elizabeth II Diamond Jubilee Medal (2012) and the Alberta Centennial Medal (2005). Clark was the first recipient of the Vimy Award. He is Honorary Chief Bald Eagle of the Samson Cree Nation. In 2004, Clark's lifetime achievements were recognized with the Award for Excellence in the Cause of Parliamentary Democracy by Canada's Churchill Society for the Advancement of Parliamentary Democracy. On Tuesday, May 27, 2008, Clark's official parliamentary portrait was unveiled during a reception ceremony to be hung in Centre Block alongside Canada's past prime ministers. In a 1999 survey of Canadian historians Clark was ranked No. 15 out of the first 20 prime ministers through Jean Chrétien. The survey was used in the book Prime Ministers: Ranking Canada's Leaders by J. L. Granatstein and Norman Hillmer. École Joe Clark School in High River, Alberta, is named in honour of Clark. Canada's sixteenth and youngest Prime Minister, he served with distinction as Secretary of State for External Affairs, President of the Privy Council and Minister responsible for Constitutional Affairs. His talent for negotiation and consensus diplomacy has served him well in politics and as Representative of the Secretary General of the United Nations in Cyprus. He has earned the admiration of all Canadians as one of our country's most respected statesmen. A demi lion Or gorged with a collar of wild roses Gules holding in the dexter forepaw a carpenter's square Azure and in the sinister forepaw a quill pen Or. Symbolism: The lion, a creature of determination and strength of purpose, is one of the supporters of the arms of Canada. Here, it is used to represent Mr. Clark’s service to the Canadian people in parliament. The wild roses are the provincial flower of Alberta. The quill pen represents journalism and advocacy through writing. The carpenter's square conveys the idea that Mr. Clark and his wife, Maureen McTeer, are builders through service. It also alludes to the McTeer family name, derived from the Gaelic word for "craftsman". On a grassy mound Vert two bald eagles Argent wings elevated and addorsed Azure each wing charged with a fess chequy Argent and Azure edged Or both eagles gorged with a collar Azure pendant therefrom the Badge of a member of the House of Commons of Canada proper. Symbolism: The two eagles recall Mr. Clark's Cree name, Honorary Chief Bald Eagle. Their wings are coloured with a chequered band of blue and white, a pattern found in Clark coats of arms in Scotland. Their collars feature the pin worn by the members of the House of Commons, to underscore Mr. Clark’s service as a parliamentarian. The grassy mound symbolizes the lawns of Parliament Hill. THE RIGHT TO KNOW · THE WILL TO SERVE. Symbolism: This phrase indicates the Clark family’s belief in enabling citizens to meet their responsibilities in an informed way, as well as the family's commitment to serve Canadians. The Canadian Alliance, formally the Canadian Reform Conservative Alliance, was a conservative and right-wing populist federal political party in Canada that existed from 2000 to 2003. The party was the successor to the Reform Party of Canada and inherited its position as the Official Opposition in the House of Commons of Canada and held it throughout its existence. The party supported policies that were both fiscally and socially conservative, seeking reduced government spending on social programs and reductions in taxation. The Reform Party of Canada was a right-wing populist federal political party in Canada that existed from 1987 to 2000. Reform was founded as a Western Canada-based protest movement and eventually became a populist conservative party, with strong social conservative elements. It was initially motivated by the perceived need for democratic reforms and by profound Western Canadian discontent with the Progressive Conservative (PC) federal government of Brian Mulroney. Dufferin "Duff" Roblin, was a Canadian businessman and politician. Known as "Duff," he served as the 14th Premier of Manitoba from 1958 to 1967. Roblin was appointed to the Senate of Canada on the advice of Prime Minister Pierre Trudeau. In the government of Brian Mulroney, he served as Senate Leader. He was the grandson of Sir Rodmond Roblin, who also served as Manitoba Premier. His ancestor John Roblin served in the Upper Canada assembly. The Conservative Party of Canada, colloquially known as the Tories, is a right-of-centre federal political party in Canada. It was formed in 2003 from the merger of the Progressive Conservative Party of Canada and the Canadian Alliance. It traces its history to the original Conservative Party of Canada that was formed after Confederation in 1867 and changed its name to Progressive Conservative Party in 1942. Robert Lorne Stanfield, was the 17th Premier of Nova Scotia and leader of the federal Progressive Conservative Party of Canada. He was born into an affluent Nova Scotia clothing manufacturing and political family in 1914. He graduated from Dalhousie University and Harvard Law School in the 1930s. Stanfield became the leader of the Nova Scotia Progressive Conservative Party in 1948, and after a rebuilding period, led the party to government in 1956. As premier, he won three straight elections. His government was credited with modernizing the way the province delivered education and medical services. 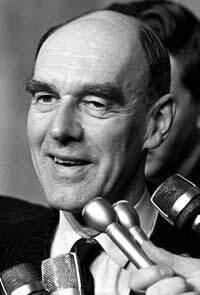 In 1967, he resigned as premier and became the leader of the federal Progressive Conservative Party. He was the leader of the Her Majesty's Loyal Opposition and fought three general elections, losing each time to the Liberals under Pierre Trudeau. He resigned as leader in 1976 and from public office in 1979. In retirement, he lived mostly in Ottawa, and died there in 2003 from complications due to pneumonia. He is sometimes referred to as "the best prime minister Canada never had". As one of Canada's most distinguished and respected statesmen, he was one of several people granted the style "The Right Honourable" who were not so entitled by virtue of an office held. Donald Frank "Don" Mazankowski, is a Canadian politician who served as a cabinet minister under Prime Ministers Joe Clark and Brian Mulroney. He was also deputy prime minister under Mulroney. He is currently a consultant with the law firm Gowling Lafleur Henderson LLP. He also serves as a director or trustee for a number of companies, including Weyerhaeuser Co., ATCO Ltd., Shaw Communications Inc., and Power Corporation of Canada. The 1984 Canadian federal election was held on September 4 of that year to elect members of the House of Commons of Canada of the 33rd Parliament of Canada. The Progressive Conservative Party, led by Brian Mulroney, won the largest landslide majority government in Canadian history, while the Liberals suffered what at that time was the worst defeat for a governing party at the federal level. Only the Progressive Conservatives faced a larger defeat, when cut to two seats in 1993. The Unite the Right movement was a Canadian political movement which existed from around 1996 to 2003. The movement came into being when it became clear that neither of Canada's two main right-of-centre political parties, the Reform Party of Canada/Canadian Alliance (CA) and the Progressive Conservative Party of Canada (PC), was independently capable of defeating the governing Liberal Party. The objective of the movement, therefore, was to merge the two parties into a single party. The goal of uniting the right was accomplished in December 2003 with the formation of the Conservative Party of Canada. The Progressive Conservative Association of Alberta was a provincial centre-right party in the Canadian province of Alberta. The party formed the provincial government, without interruption, from 1971 until the party's defeat in the 2015 provincial election under Premiers Peter Lougheed, Don Getty, Ralph Klein, Ed Stelmach, Alison Redford, Dave Hancock and Jim Prentice. At 44 years, this was the longest unbroken run in government at the provincial or federal level in Canadian history. Claude Wagner, was a judge and politician in the Province of Quebec, Canada. In his career, Wagner was a Crown prosecutor, professor of criminal law and judge. The 1980 Canadian federal election was held on February 18, 1980, to elect members of the House of Commons of Canada of the 32nd Parliament of Canada. It was called when the minority Progressive Conservative government led by Prime Minister Joe Clark was defeated in the Commons. The 1979 Canadian federal election was held on May 22, 1979, to elect members of the House of Commons of Canada of the 31st Parliament of Canada. It resulted in the defeat of the Liberal Party of Canada after 11 years in power under Prime Minister Pierre Trudeau. Joe Clark led the Progressive Conservative Party to power, but with only a minority of seats in the House of Commons. The Liberals, however, did beat the Progressive Conservatives in the overall popular vote by more than 400,000 votes. The 1976 Progressive Conservative leadership election was held at the Ottawa Civic Centre in Ottawa on February 22, 1976, to elect a leader of the Progressive Conservative Party of Canada to replace Robert Stanfield, who had resigned after losing the 1968, 1972, and 1974 elections. It unexpectedly elected a 36-year-old, little-known PC Member of Parliament from Alberta as the party's new leader. Joe Clark defeated Claude Wagner on the fourth ballot of the convention by a margin of 65 votes. Douglas Grinslade "Doug" Lewis,, is a Canadian accountant, lawyer and former politician. André Harvey, PC is a Canadian consultant, politician and former teacher in Quebec, Canada. The 1998 Progressive Conservative leadership election was held on October 24 and November 14, 1998 to choose a successor to Jean Charest. This was the first time the Progressive Conservatives used a one member, one vote system to choose a leader rather than a delegated leadership convention, which has been the norm since 1927. The 1998 election used a point system that allocated 100 points to each riding, regardless of the number of votes cast in the riding. The candidate who won a majority of points would win the leadership. All party members were eligible to cast a vote. If no candidate received a majority of points on the first ballot, the lowest ranking candidate would be automatically eliminated and a second ballot was to be held using a preferential ballot if more than two candidates remained. The 100-point-per-riding system was again used by the Conservative Party of Canada in its 2004 leadership race. This article is the Electoral history of Joe Clark, the sixteenth Prime Minister of Canada. ↑ Paul Leonard Voisey. High River and the Times: An Alberta Community and Its Weekly Newspaper . Retrieved 2016-08-02. 1 2 3 4 Joe Clark: A Portrait, by David L. Humphreys, 1978. 1 2 3 4 Mulroney: The Politics of Ambition, by John Sawatsky, 1991. ↑ Mulroney: The Politics of Ambition, by John Sawatsky, 1991, pp. 312–313. ↑ Joe Clark: The Emerging Leader, by Michael Nolan, 1978, p. 11. 1 2 3 "Fall of a government (Television)". CBC Digital Archives. December 13, 1979. Archived from the original on January 2, 2013. Retrieved July 1, 2009. ↑ "Minority government lessons". CBC. September 16, 2004. Archived from the original on August 12, 2010. Retrieved July 1, 2010. ↑ MacEachen, Allan J. (December 11, 2009). "Behind the fall of Joe Clark". Toronto Star. ↑ Simpson, Jeffrey; Sheppard, Robert (December 14, 1979). "Tories Fall, 139 to 133". Globe & Mail. Archived from the original on December 5, 2005. ↑ Crosbie, John (June 11, 2006). "Terrorism and Multiculturalism in the West". The Independent. Newfoundland and Labrador. p. 12. ↑ Memoirs, by Pierre Elliott Trudeau, McClelland & Stewart, 1993, Toronto, pp. 251–252. ↑ Delacourt, Susan (May 25, 2012). "When the Queen is your boss". Toronto Star. Archived from the original on March 7, 2013. Retrieved May 27, 2012. ↑ Shallit, Jeffrey (October 13, 1999). "David Orchard spouts anti-U.S. rhetoric and racists sentiments". The Record . Kitchener, Ont. Archived from the original on May 11, 2014 – via ProQuest. ↑ Dornan, Christopher; Pammett, Jon H. (2001). The Canadian General Election of 2000. p. 21. ISBN 9781550023565. ↑ "PC membership doubles but still low". CBC News. April 8, 2003. Archived from the original on November 7, 2012. ↑ "Joe Clark says he'd choose Martin over Harper". CTV News. April 26, 2004. Archived from the original on June 3, 2004. ↑ "Inter-American Dialogue | Experts". www.thedialogue.org. Retrieved 2017-04-11. ↑ "Former PM Clark punched in attack". Montreal Gazette . December 8, 2007. Archived from the original on May 11, 2014. ↑ "Order of Canada – Charles Joseph Clark, P.C., C.C., A.O.E., M.A., LL.D." Office of the Secretary to the Governor General. Archived from the original on August 27, 2011. ↑ "UNB Honorary Degrees Database". Lib.unb.ca. Retrieved 2016-08-02. ↑ "Honorary Degree Recipients". University of Calgary. Retrieved 2016-08-02. ↑ "Past Honorary Degree Recipients". University of Alberta. Archived from the original on March 4, 2016. Retrieved August 2, 2016. ↑ "Honorary Degree Citation - Joe Clark". Concordia University Archives. Retrieved 2016-08-02. ↑ Current Students (2016-07-28). "Honorary Degree Recipients". Secretariat.info.yorku.ca. Archived from the original on March 18, 2015. Retrieved 2016-08-02. ↑ "Honorary Degrees Awarded Since 1954". Carleton.ca. Retrieved 2016-08-02. Winners, Losers, by Patrick Brown (journalist), Rae Murphy, and Robert Chodos, 1976. Joe Clark: A Portrait, by David L. Humphreys, Toronto 1978, Deneau and Greenberg Publishers Ltd., ISBN 0-00-216169-9. Joe Clark: The Emerging Leader, by Michael Nolan, Toronto 1978, Fitzhenry & Whiteside, ISBN 0-88902-436-7. One-Eyed Kings, by Ron Graham, Toronto 1986, Collins Publishers. The Insiders: Government, Business, and the Lobbyists, by John Sawatsky, 1987. Prime Ministers of Canada, by Jim Lotz, 1987. Mulroney: The Politics of Ambition, by John Sawatsky, Toronto 1991, MacFarlane, Walter, and Ross publishers. Memoirs, by Pierre Elliott Trudeau, Toronto 1993, McClelland & Stewart publishers, ISBN 0-7710-8587-7. Memoirs 1939–1993, by Brian Mulroney, 2007. Bold indicates parties with members elected to the House of Commons.